the thickened, central portion of the deep palmar fascia; it radiates toward the bases of the fingers from an apical attachment to the transverse carpal ligament, usually as a continuation of the tendon of the palmaris longus muscle. a sheet of fascia under the skin of the palm and surrounding the muscles. 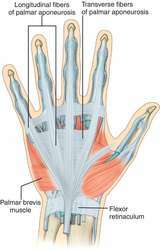 Also called palmar fascia. The palmar aponeurosis pulley as a cause of trigger finger. Dupuytren's contracture: morphology and biochemical changes in palmar aponeurosis. 1) Palmaris Longus tenses the palmar aponeurosis thus stabilizes the palmar skin in grasping the object. The work appeared in the London Medical and Surgical Journal in 1832, detailing the surgical treatment for an affection of the palmar aponeurosis (Dupuytren contracture). Palmar aponeurosis was exposed and separated from flexor retinaculum.